A prisoner is brought down the "runway" into one of the buildings on the sprawling complex at the Maine Correctional Center in Windham. 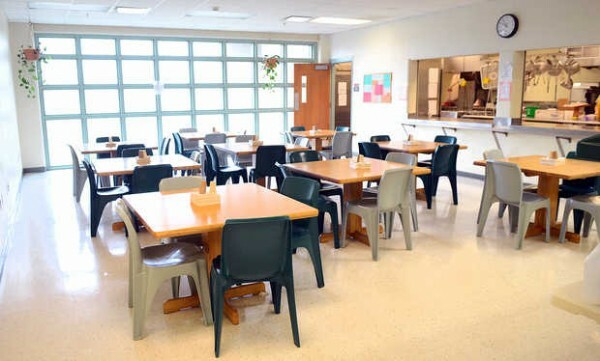 The cafeteria in the women's block, which is one of the newer facilities at the Maine Correctional Center in Windham. An inmate talks to another in the doorway of one of the numerous housing units at the Maine Correctional Center in Windham. WINDHAM, Maine — Inside this fenced-in, fortresslike prison building, guards never stop watching from behind tinted windows. 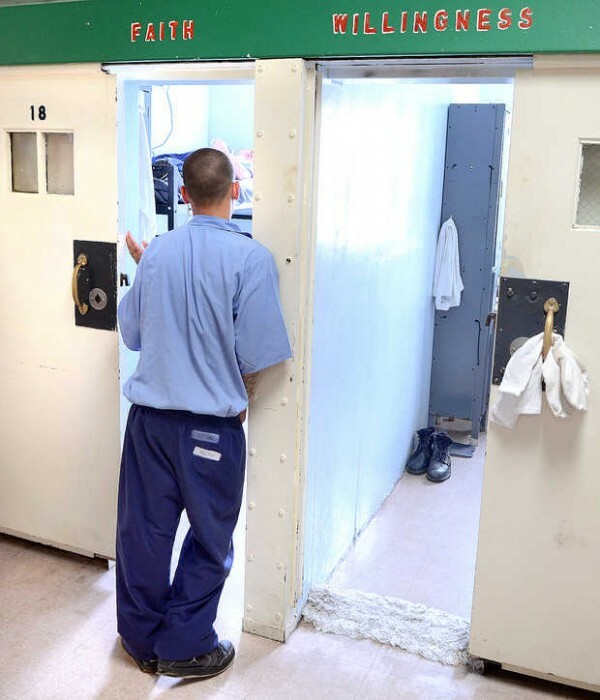 While officers walk through the crowded holding area where the Maine Correctional Center confines all incoming male inmates, guards in the control room survey the scene: New arrivals are watching TV, playing cards and sleeping away their first days there. From inside their capsule, the guards remotely control all traffic in and out of the area, toggling keyless electric locks that snap inside steel doors. The state pays $1 million a year for every 16 corrections officers, according to Maine Corrections Commissioner Joseph Ponte. Five officers — $312,500 a year by his math — are needed to staff just one around-the-clock post. “We think we can be more efficient,” Ponte said recently as he walked through the sprawling Windham complex. From the holding area, he stepped into a long corridor and walked past another around-the-clock control center and another $312,500 post. This 23-year-old building, which is officially called the Multi-Purpose Unit and is one of a host of buildings on the site, has four control centers in all. It’s too many, says Ponte. And he has a plan to get rid of them. He wants to tear down the 40,450-square-foot unit and most of the other locked-down buildings at the Maine Correctional Center. In their place, he would erect a new, more efficient prison. It would cost $100 million. The project, which includes borrowing the money to build it, drew support from Gov. Paul LePage when it first was introduced to the Maine Legislature last spring. However, lawmakers balked at the scale of the project. They recoiled at giving the Department of Corrections permission to borrow that much money without a voter referendum, and they said Ponte’s plan lacked detail. This fall, he plans to commission a feasibility study to examine his plan. He will return to the committee next spring with documents and data, he said. The Ponte plan would close or reduce operations at smaller Maine prisons — the Downeast Correctional Facility in Machiasport, the Women’s Center in Alfred and the Charleston Correctional Center outside Bangor — eliminating more than 100 staff positions. The inmates from those prisons would be moved to the bigger, better Windham prison, where the same staff of 300 who work there now would oversee a 50 percent increase in inmates, from about 600 to 900. One key to the plan is an overall reduction in staff, Ponte said. The savings in personnel would cover the cost of the $100 million bond in 15 years or less, he said. Another key to Ponte’s plan is the design of the new prison. The new prison would need fewer staff, which now account for about 75 percent of the Windham facility’s $23 million annual budget, he said. Rather than old-fashioned design aimed at locking people in an area and watching them from outside, he said, the new prison would be designed to have corrections officers locked into a common space with inmates and give those officers the sight lines to see everything happening in the space — something called “direct supervision” in corrections jargon. It’s the principle behind the design of Maine’s newest jails in Somerset, Cumberland and York counties, and at Two Bridges Regional Jail in Wiscasset. Movement between areas would be better engineered and one control room would watch it all. Such changes would be impossible in the current complex at Windham, which resembles a collection of jails rather than a unified prison. Buildings date to 1923, and they look it. There are 1980s-built dorms housing sexual offenders, which would be razed under Ponte’s plan, and a pair of 1990s dorms housing medium-security inmates, which would stay. The current showpiece in the complex is the women’s center. Built in 2003, it looks like a university student center. It has a large common area with couches and classrooms and lots of natural light. The cafeteria, with restaurant-style tables, looks like a hospital lunchroom. It would stay, Ponte said. Scott Landry, who began work as the prison’s superintendent on Aug. 5, agrees much needs to go at the Maine Correctional Center. Both Ponte and Landry believe that a new facility would allow the prison to create a first-in-Maine section for elderly prisoners, offer more rehabilitation programs for inmates and give more minimum-security inmates a chance to get jobs. The prison holds medium- and minimum-security inmates. However, a new Windham prison would accept some maximum security or “close supervision” inmates, Ponte said. It sounds like a reasonable plan, said Rod Miller, an analyst who travels the country examining jails and prisons. Miller’s company, Community Resources Inc., based in Gettysburg, Pa., often works with the U.S. Department of Justice. This spring, he analyzed Maine’s network of county jails. The Maine Correctional Center in Windham, which he has visited several times, is an example of an inefficient prison, Miller said. Design can cost governments millions of staff dollars, he said. Typically, personnel costs about 75 percent of a corrections budget. Miller declined to guess how much money might be saved with Ponte’s plan. In that case, the Lucas County Jail’s 450 inmates cost almost $3 million a year more to house than a similarly sized jail in nearby Indiana, he said. Plenty of U.S. jails, which tend to have a busier, more transient population than prisons, operate with a staff of 300 and a larger capacity than the proposed 900-inmate Windham prison, Miller said. The scale of the Windham facility better compares with jails nationally. “Nine hundred beds is a small prison in the world of prisons,” he said. He said the new prison might compare well with the Montgomery County Correctional Facility in Boyds, Md., which he described as a “gold-plated” facility for both its efficiency and its programs offered to inmates. That place has a capacity of just over 1,000 inmates and runs with a staff of about 300, Miller said. That jail, located near Rockville, has the standard rehab and medical care services, mental health services that include a crisis intervention unit and an employment center. The 3-to-1 ratio of prisoners to staff is possible in Windham, Miller said. Ponte’s plan sounds great, said state Rep. Mark Dion, D-Portland, a co-chairman of the Legislature’s Criminal Justice Committee. But he is skeptical. And he says he has heard it before. Dion listened to similar predictions of cost savings when he was elected as the Cumberland County sheriff and a new county jail was being built. He thought about it when Ponte and his staff appeared before his committee. He wanted to see numbers and data. “I managed a direct supervision facility,” he said. “I want to see the staff plan. I want to see exactly how you’re going to populate this prison. However, Dion said he hasn’t made up his mind. Maine’s prison system has been faulted before for its high inmate-to-officer ratio, he said. Ponte stands by his forecasts. The veteran corrections administrator pointed to the last place he worked — the Nevada Southern Detention Center in Pahrump, Nev. — as an example of an efficient prison. Run by the private firm CAA, it houses about 1,000 inmates with just 232 staff. There are few special programs, but it’s efficient, according to a Department of Corrections employee assigned to answer questions about the facility. Maine already spends a lot on its inmates. In 2009, the Maine Department of Corrections spent $159 million, according to the state’s Office of Program Evaluation and Government Accountability. That number fell to $142 million by 2011. Over the same period, the cost per inmate declined from $54,000 in 2009 to $51,825 in 2011. The cost is higher than similar states. A 2011 comparison found Maine’s cost per inmate to be the seventh highest in the country. In 2011, the price of housing an adult prisoner in Maine was about $118 per day. OPEGA compared the cost with several other states: Iowa spent $85 per day. North Dakota spent $90. South Dakota spent $46. Wyoming spent $126; Rhode Island $148. Per-day costs would drop with the kind of capital investment he’s proposing, Ponte said. Maine is behind most other states in spending on its prison facilities. In the 1980s, the state spent about 9 percent of its corrections budget on new prisons, renovations and maintenance. In the 1990s, it fell to 3.3 percent, according to the U.S. Department of Justice’s Bureau of Justice statistics. Between 2002 and 2010, capital costs accounted for only 0.4 percent of corrections spending in Maine, tying with Vermont for last place in the country, the bureau reported. Better uses for the money? It’s the cost of the Ponte plan, at a time when funds for capital spending in the state are so scarce, that upsets Gerzofsky, who has visited the Windham prison several times. The Brunswick legislator believes the $100 million would be better spent on rundown schools or other dilapidated public buildings in Maine. He said he also opposes allowing the money to be borrowed without a referendum. Ponte presented it as a bond needing only the governor’s approval. Advocates for Maine’s prisoners also oppose Ponte’s $100 million plan. “Our priority should be to decrease the number of people who needlessly come in contact with the criminal justice system in the first place,” said Shenna Bellows, executive director of the ACLU of Maine. “There is a growing consensus in Maine and across the country that we are locking up too many people for low-level crimes with devastating consequences for individuals, families and our communities. Overincarceration is the root cause of overcrowding and strains our state and local corrections budgets. The best investment the state can make is in alternatives to incarceration,” she said. The Maine Prisoner Advocacy Coalition opposes the construction at a time when talks are underway to change sentencing guidelines that ought to ease the prison population. “We don’t think Maine has the money,” said Jane Garvey, the coalition’s co-chairwoman. The Windham prison needs renovations to tackle such issues as leaky roofs and mold. More money ought to be spent on programs to rehabilitate prisoners, she said. The state needs to find “creative solutions for renovations and program growth rather than building a new prison,” she said. To Ponte, the new jail is a practical answer. “I look at this from a business sense of providing good correctional services to the state of Maine. We can do that more efficiently with a new facility,” Ponte said. Besides the price, he also expects to get criticism for the job cuts at the prisons that would close or shrink under the plan, particularly in economically depressed Washington County. As much as possible, cuts will be made through attrition and people will be offered the chance to relocate, he said. Members of the corrections officers union at the prison declined to comment. Ponte said the alternative to his plan is to keep going and do nothing.